It all began as a normal day. We were all sitting at the tables in the library before school. Harvey and Kellen were arguing over why Darth Maul didn’t die in Episode 1. Then, I saw a new kid walk in. He was wearing a starwars t-shirt and jeans. The new kid just kind of wandered over here. “Hi” I said. “Hi” he said back. “I see you like starwars” I said gesturing at his shirt. “Oh yeah” he said. Then, He pulled out an origami Boba Fett. “Awesome” Kellen and I said at the same time. As usual Harvey butted in “Is that supposed to be Boba Fett! ?” Harvey snickered. “Shut up” I said to Harvey “it’s awesome”. “My name is Jack” said the new kid,”Nice to meet you” I replied. After all those losers left, Jack and I were the only ones left. “So” I said, “How much will it cost for Boba Felt to work for me?” “Umm.. He’s not really up for hire at the moment.” “Oh come on! He has to want something!” Well… He has been eyeing an origami t-7 blaster rifle lately… “Great! I’ll bring one tomorow!” “So… What do you want in Return?” Asked Jack. “I need you to bring me Tommy’s past few case files, so I can write my comments through them!” I said. “I will be done before you can say mandalore.” Said Jack in an Awesome Boba Fett impression. “Good to work with you Boba Felt!” I said. Umm.. hi. Tommy asked me to write a chapter, soo yeah. Um, well, a few people have been wondering about Boba Felt and how he works so, I guess I’ll tell you. 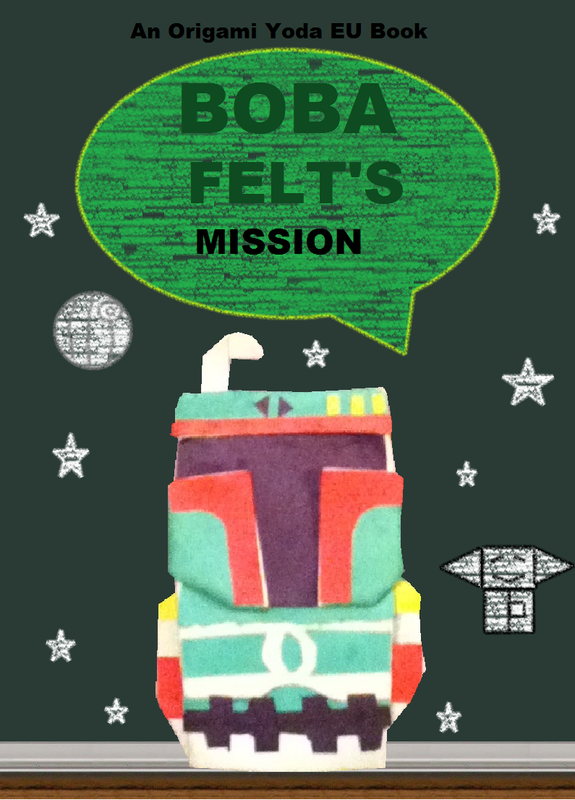 Boba Felt can be hired on different missions… For a price. Usually, he doesn’t do anything that’s too crazy. Also if he is on a mission he usually can be bribed for a higher price. So, yeah now you know how his system works. I hired Jack and Boba to find out what Harvey was writing in his secret chapter. Great. This is just what we needed. Another guy against us. We need to find a solution to the problem. “Lets ask Yoda!” Said Kellen. So we walked over to Dwight. “Question you have?” Said Yoda. “Yes we do, we need to know what to do about Boba Felt.” Said Kellen. “What mean do you?” Yoda screeched. “Well, Harvey hired Jack and Boba Felt to steal the case files.” I said. ” Analyze Jacks chapter more you must” Yoda said in a matter-of-fact tone. “Whatever you say” Kellen said enthusiastically. Right as Boba and I were about to steal the case files (which I didn’t really want to do in the first place, because I really think Dwight and the gang is awesome), Tommy and Kellen walked up to me. “We know what you’re up to” they said “we have a deal for you.” “What is it?” I said. “We offer you a bag of Cheetos, in return for loyalty to the rebellion” they told us. After thinking for a moment, I made up my mind. “It’s a deal!” I told them. So, after we walked away from Harvey, Jack told me that he would be needing his Cheetos now. I laughed and gave them to him. I’m sorry I didn’t tell you I was moving, I had urgent business to attend. But I’ll see you guys again. This isn’t my last mission to McQuarrie Middle School. Ttyl. PS. My Employer says hello. Awesome! But why didn’t you start with jango instead? NOOOOO lol you cut out the soapy part that was my favorite part!!!! Oh, I’m sorry! It just seemed kinda out of place with the rest of the story……….. Maybe I could throw that chapter into the Drawa story? yes put it in the drawa!!!! Also, when do i become an admin? That was an awesome story!! You should add doodles to this, like you did with The Rise of Jango Fortune. Is this story connected to Jango Fortune? If so where is Tony? If you read the end of Jango Fortune, you’ll see that a kid takes Boba Felt off the floor in the last scene, and keeps it to himself. That’s Jack. He just lied about making his own one. Stooky! I love it! However,I’m scared about what happens to Yoda. Sorry to be a Harvey, but didn’t Origami Yoda get sent away to Captain Micah? Chapter 2: [Starts doing Vader impression.] It would be an honor if you would join us…for lunch in the library. Chapter 4: They stole all the case files? Then why is this one still being wrote in? Chapter 5: Wait…what’s the ding-dang plan? Chapter 6: The heck is going on…?